Just over two months before his tragic death from a brain hemorrhage, Charlie Gardiner posted a shutout as Mush March scored the Cup winner in double overtime in the Black Hawks' 1-0 win over Detroit in Game 4 of the Stanley Cup final at Chicago Stadium, on April 10th 1934. The victory served as the very first championship in The Windy City, with Black Hawks owner and deceased Hall of Fame builder McLaughlin deciding how best to remember the 1933-34 team's championship. A sterling silver replica Cup was decided upon, with this gorgeous keepsake made for his personal display by the renowned jeweler Birks. 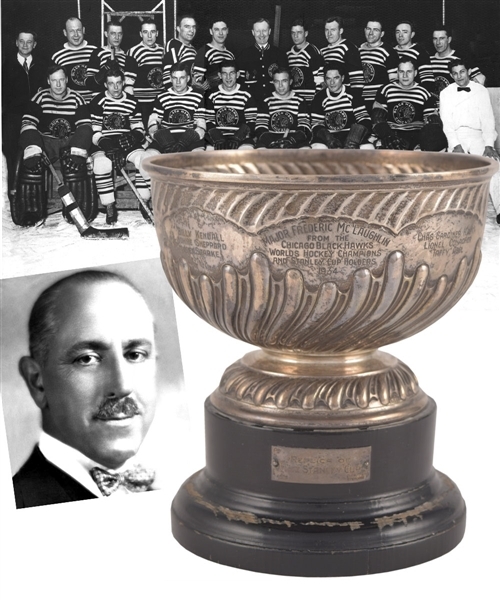 Examples of this Stanley Cup trophy were not given to team members, with "Major Frederic McLaughlin from the Chicago Black Hawks, World's Hockey Champions and Stanley Cup Holders 1934" beautifully engraved on the front of the bowl. The names of the 18 Black Hawks players are engraved in groups of three as you move along the sides of the bowl to the back, which has Tommie Gorman's name engraved on it along with trainer Eddie Froelich. "Birks" and "Sterling" are stamped on the right bottom edge of the bowl in line with the names of Gardiner, fellow HOFer Lionel Conacher and Taffy Abel. This incredible trophy looks just like the early Cup versions and it would have been terribly expensive back in the day to have made. The bottom of the bowl has been stamped with three hallmarks: a lion passant, a sheaf of wheat and the letter "T" for 1934. (T is the date letter that corresponded to the London date letter for the year of production.) The mouth of the Cup measures 6" in diameter and the sterling silver Cup itself stands 4 1/4" tall, perched atop a 2 1/4" tall black wood base that measures 5 1/4" in diameter across the bottom. "Replica of the Stanley Cup" reads the front plaque, centered over the trophy's round wooden base. The names engraved around the Cup are as follows: Chas Gardner (Capt), Lionel Conacher, “Taffy” Abel Art Coulter, Roger Jenkins, Elwin Romnes Paul Thompson, Harold March, Donnie McFadyen Tommie Gorman, Manager; Eddie Froelich, Trainer Lolo Couture, Johnnie Gottselig, Tommie Cook Leroy Goldsworthy, Louis Trudel, Jack Leswick Billy Kendall, Johnie Sheppard and Joe Starke. There are various scrapes to the black paint exposing the bare wood around the base along with white residue along the rim of the base, with tarnishing and surface wear to the mounted bowl. There are no major dents or dings to the bowl, and it retains its circular continuity. Celebrating the very first Stanley Cup championship of one of the most venerated and collected NHL clubs in history, this unique one-of-a-kind memento made specifically for the owner of the Chicago Black Hawks is demanding of placement within only the greatest Black Hawks or Stanley Cup collection.